I am very excited to have joined this online card class...finally last night I decided to join and here I am with my first assignment. Estoy muy emocionada de haber decidido meterme en esta clase online de tarjetas...anoche por fin decidí meterme y aquí estoy con mi primera tarea. It is being hosted by Jennifer McGuire and Kristina Werner. 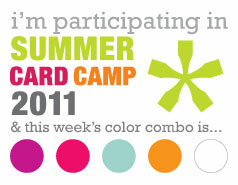 Our first color challenge is warm shades of purple, pink, orange, sky blue and white. La clase es ofrecida por Jennifer McGuire y Kristina Werner. Nuestro primer desafío era trabajar con colores veraniegos, morado, rosa, naranja, azul cielo y blanco. I decided to make 3 cards as I was experimenting with the watercolors and the color combo we were supposed to use. Hice 3 tarjetas porque estaba experimentando con las acuarelas y el combo de colores que nos han propuesto esta semana. I white heat embossed the stamp (heroarts) on watercolor paper, then painted the background with watercolors, since the embossed area resisted the paint the picture started to show up, and finally mounted it on a dry embossed card stock. Hice un "emboseado" blanco del sello (heroarts) en papel de acuarelas, luego pinté el fondo con acuarelas, y la imagen se conmezó a ver porque el area del sello resistía la pintura, y finalmente lo monté en una cartulina con relieves (dry emboss). I love your card! I'm taking the class too. Very pretty cards - isn't camp fun?? hola gaby, soy mary pat de siehledwithakiss.blogspot.com--muchas gracias por sus "commenst" simpaticas. me gusta mucho tu tarjeta! donde vives en espana? yo vivi en sevilla en 1987 y en madrid en 1997. me encanta espana! Me gusta como utilizaste el morado!